Hygge is a Danish lifestyle hack that loosely translates to being warm and cozy with friends while outside it is dark and cold. The concept is particularly vital in the winter, when comfort and cheer are necessary to combat the season’s long, dreary nights. And like most good things, Hygge is best enjoyed when it’s been earned. Nothing enhances the peaceful contents of a snowy cabin like a full day of exploring the frozen Appalachians. Here are four Hygge-inspired adventures in the southeast to experience this winter. #1 Jones Mountain Cabin, Va. 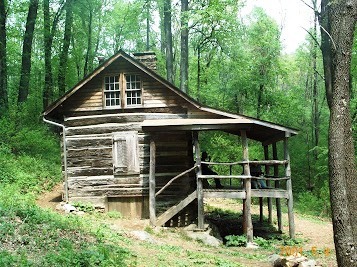 The Jones Mountain Cabin, nestled inside the wilderness of Shenandoah National Park, is like a portal to early America. Visitors will need to light a flame in the hearth and a fire in the wood stove in order to fill this rough-hewn log cabin with heat and warmth. Secluded in a quiet hardwood forest, this rustic abode is prime territory for finding Hygge. The cabin is available to rent through the Potomac Appalachian Trail Club. It is the most remote of all the cabins available in the Shenandoah Wilderness. The hike in is a three and a half mile journey of gentle climbs and descents through a landscape that’s as peaceful as a Robert Frost poem. The cabin is a nice space for two, but it can sleep up to ten if you’d like to bring along your friends. According to the Danish people, masters of coziness, the more people to gather around the woodstove, the better. For the evening’s entertainment, Bear Church Rock Overlook is a quick side hike away. With far-reaching views of the Virginia Appalachians, this rocky outcrop is a beautiful spot to settle in with a sleeping bag and a mug of hot chocolate to take in a wintery pastel sunset. From the Polar Express to the Box Car Children, train travel has always been iconic of cozy exploration. The New River Trail is a linear state park in Southwest Virginia that follows an abandoned railroad. 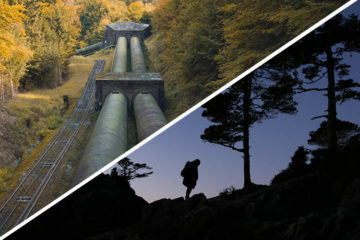 Whether you’re traveling by foot, bicycle, or horseback, this 57 mile long trail passes over bridges and trestles, travels through tunnels and countryside, and coasts along the picturesque New River. After a snowfall, its gentle gradient begs to be explored by snow shoe or cross-country ski. What could be more fitting after a day of riding the rail trail then bunking down in your own train car? Grassy Creek Caboose and Depot in Fancy Gap may be the quirkiest—and coziest—accommodations you’ll find along the Blue Ridge Parkway. Each private caboose is a retired working train car refurbished with all the modern amenities, including a Jacuzzi built for two. The Depot sits on thirty-three acres of high altitude meadows and pine thickets, with Grassy Creek running through. Curl up and watch the snowflakes twirl from inside your tiny train, or take in the stars from the pocket-sized front porch. #3 Sleepy Creek Cabin and Grandfather Mountain, Boone, N.C. Grandfather Mountain State Park’s 2,456 acres of backcountry are a paradise of shimmering alpine forests and windswept summits in the winter. Ice-slick ladders and exposed rocky scrambles transform a day on the trails into an exhilarating endeavor, priming you for maximum coziness later on. Tucked away on four wooded acres, yet only fifteen minutes outside of Boone, Sleepy Creek Cabin is the epitome of high country Hygge. It’s the very scene you daydream about at the end of a cold day in the outdoors: a rustic home of stone and logs, its windows glowing with lamplight inside a frosted forest. Here you can savor a perfect evening après in front of a blazing fire, and study the trail map over your morning coffee on the quiet front porch. #4 White Grass Garage Mahall and White Grass Ski Center, W.V. The White Grass Touring Center is situated in the Cabin Mountain Range of West Virginia’s High Alleghenies. Thirty-seven miles of maintained trails wind through the snowy landscape, topping out at 4,463 feet. The Trailside GarageMahal is a private, two-bedroom lodge that sits adjacent to the touring center. On a secluded eight-acre preserve of woods and frozen waterfalls, this comfy cabin is a perfect basecamp for a weekend of Nordic skiing through the Canaan Valley.